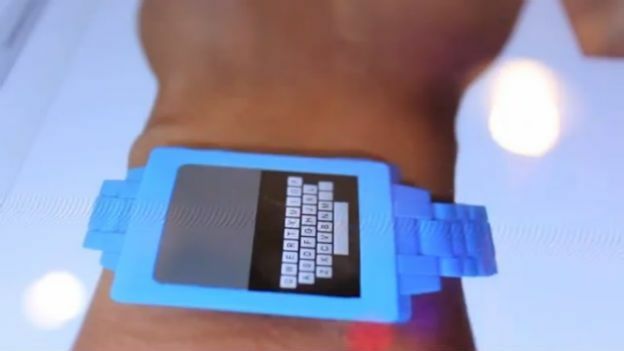 The ZoomBoard, a penny-sized touchscreen keyboard has been created by a group of researchers at Carnegie Mellon University, to solve the issue of text input on the tiny screens that come with smart watches. An upsurge in smart watch development started earlier this year with Pebble's Kickstarter campaign, followed by Samsung confirming its development of a model and word of Apple and Microsoft creating their own versions hit the rumour mill. A paper published online explains the ZoomBoard aims to fill the gap where the Sony SmartWatch and Apple iPod Nano lack in terms of text entry. It explains that text entry experiments have taken place on the soft 16 x 6mm keyboard and that, "After eight practice trials, users achieved an average of 9.3 words per minute, with accuracy comparable to a full-sized physical keyboard." The ZoomBoard allows "iterative zooming until keys are sufficiently enlarged that they can be comfortably and accurately pressed." The keyboard also has a built-in space boar, the ability to swipe right to insert a space or left to delete. Swiping upward reveals symbols. According to MIT Technology Review, Chris Harrison co-author of the paper says, "the group doesn't plan to commercialize Zoomboard, but he says the source code - which is only about 100 lines - is available online for anyone to use." The ZoomBoard will be presented at the Computer Human Interaction conference in Paris next weeek. A demo is available online to trial for iPod Nano, Smartphone or full size, to try it out click here. Watch the video below to find out more about ZoomBoard.